Here is my collection of "wood". I do have a few "new" boards, even some still in plastic. But for the most part all my boards have history. I and my friends rode these setups. We skated 'em when they were new.. and after they became a few years old. Nothing was sacred. 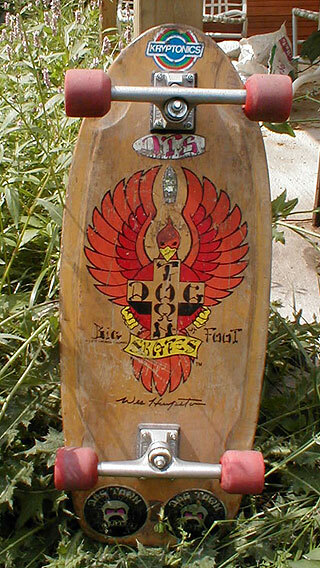 Even today, I take my '85 Santa Cruz "Duane Peters" out and carve bowls with it. Its still a perfect design and needs to be skated. santa cruz "ramp street 10" santa cruz "duane peters" powell/peralta "skull and sword" powell peralta "per welinder" zorlac "devilfish"
h-street "ron allen" sims "lonnie toft" santa cruz "duane peters" "possessed to skate"
Click to read a COOL story about this SMA deck. 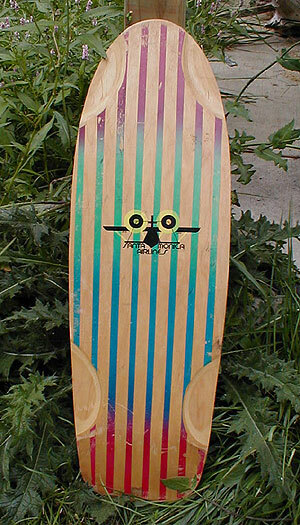 santa monica airlines longboard 48"